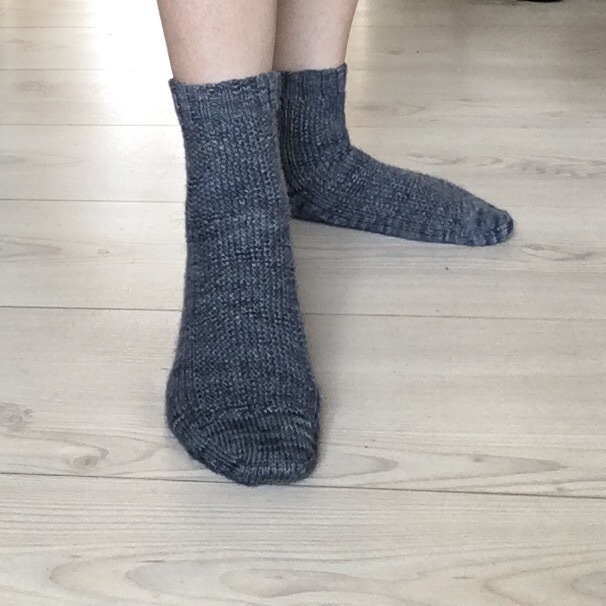 Yeah I got a bit distracted in my last post, I was supposed to be showing you my new socks. Consider this part one of the great summer catch up! 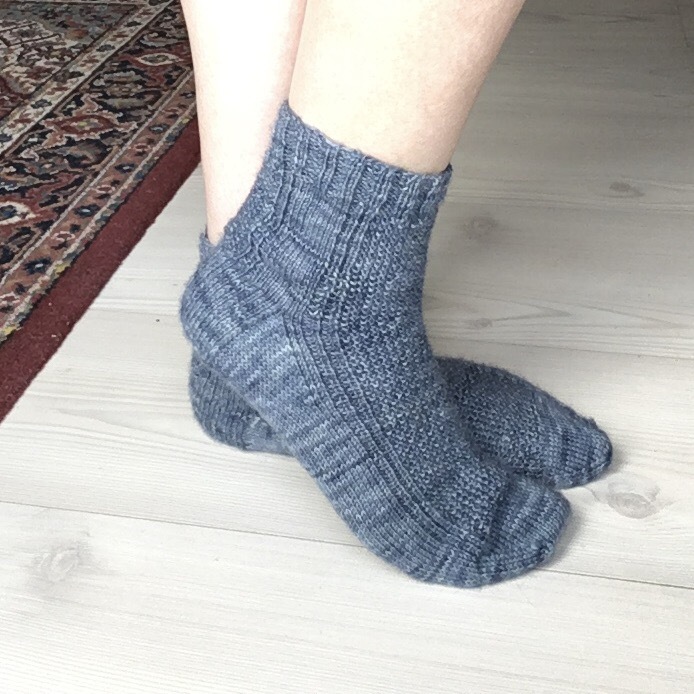 Back at the beginning of summer I felt it was time I made another pair of socks for me! But I couldn’t find a pattern that I liked. 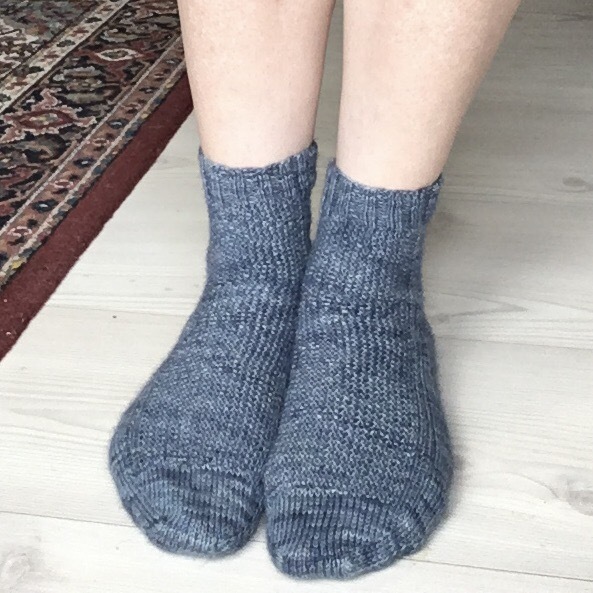 I wanted them to have some texture, but also some ribbing to make the fit really good, and also to have a lovely clean look to them (not too busy). Well there was just nothing out there!! So I decided to just make up my own pattern. 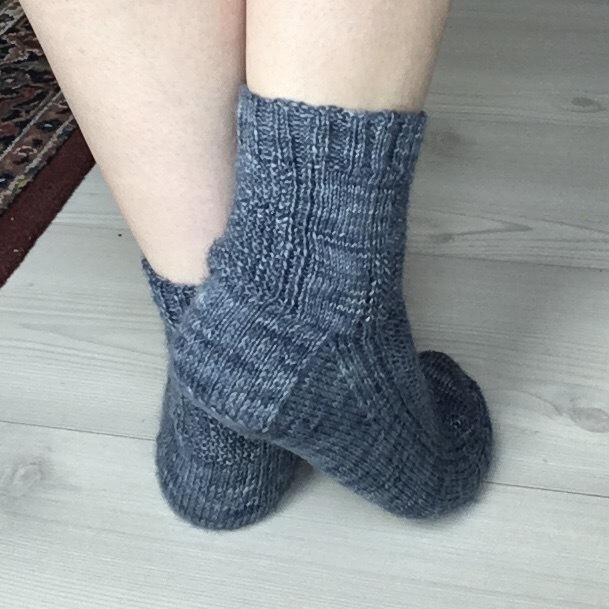 I used the stitch count according to gauge and foot width. I added a panel of moss stitch front and back (texture? Check! ), some lines of ribbing on each side of those panels (snug fit? Check! ), and used a slip stitch heel which I think looks really smart (clean smart look? Check and check!). I’m afraid I can’t remember what the wool is. I seem to remember the colourway being denim, but beyond that I can’t say much. I know, a bit rubbish… sorry. It’s a good yarn though, nice and sturdy but softens up lovely with a bit of blocking. The panels on the front are 16sts wide with two rib rows (K3, P1, K1, P1, K1, moss stitch 16sts, K1, P1, K1, P1, K3). The back panel is the same sort of thing but the moss stitch is only 10sts wide. It’s not much of a pattern but I think it’s very effective. I really love how the moss stitch has broken up the stripes in the yarn, which you can see here just next to the heel. And yes my feet really are just that flat… I have zero arches! It’s nice to have added to my own personal collection again… but I must make myself a pair which aren’t blue!! 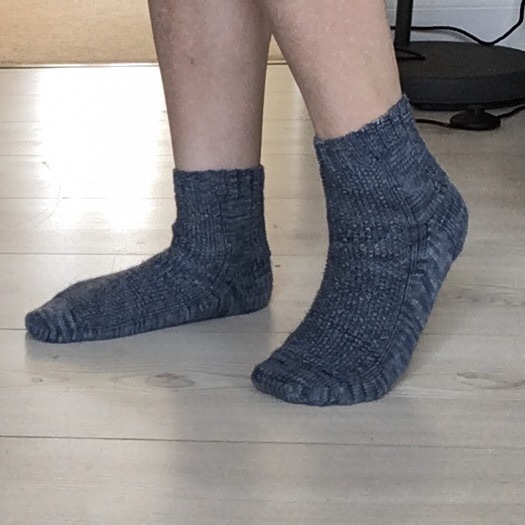 Previous Post How many socks are too many?